Instead of correcting or refining the record and pursuing meaningful accountability against the perpetrators of these crimes the Obama administration has left outdated, misleading accusations in the public domain, all the better to fit with some geopolitical goals, such as delegitimizing the Syrian and Russian governments. In other words, providing the American people with substantive updates on these atrocities and advancing the cause of justice take a back seat to keeping some geopolitical foe on the defensive. What is perhaps most troubling in both cases, however, is that the killings involved serious crimes against humanity and the perpetrators have not been identified and brought to justice. Whatever new evidence U.S. intelligence has collected could help track down who was responsible but that doesn’t appear to be a priority for President Obama. In the MH-17 case, the timetable for the next scheduled release of information is on the first anniversary of the shoot-down, which occurred on July 17, 2014. Given that the shoot-down, which killed 298 people, should be an active criminal investigation, it makes little sense to delay disclosures for something as artificial as an anniversary, giving whoever was responsible more time to slip away and cover their tracks. A photograph of a Russian BUK missile system that U.S. Ambassador to Ukraine Geoffrey Pyatt published on Twitter in support of a claim about Russia placing BUK missiles in eastern Ukraine, except that the image appears to be an AP photo taken at an air show near Moscow two years ago. In the meantime, the U.S. government continues to re-release its initial claims putting blame on foreign adversaries the governments of Bashar al-Assad and Vladimir Putin so the assumption may be drawn that the updated analyses go in different directions, possibly implicating U.S. allies, such as Turkey or Saudi Arabia regarding the sarin attack and elements of the U.S.-backed Ukrainian regime in the MH-17 case. Whatever the truth, however, it is hard to justify why the U.S. government has withheld evidence in these criminal cases, whoever is implicated. On Wednesday, the Obama administration declassified its own claims that Russia had deployed air defense systems in eastern Ukraine and had built up its forces along the border with Ukraine, assertions that Russian officials denied, though those denials were not included in the article on Thursday by New York Times’ national security reporter Michael R. Gordon, who treated the allegations essentially as flat fact. But the intelligence appeared to be just U.S. accusations. In Kiev, U.S. Ambassador Geoffrey Pyatt tweeted about “the highest concentration of Russia air defense systems in eastern Ukraine since August” and illustrated his claim by showing a photo of a BUK anti-aircraft missile system. 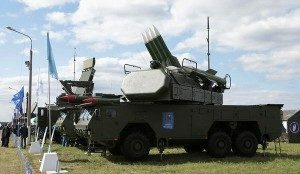 But the photo appeared to be an Associated Press photograph taken of a BUK system on display at an air show near Moscow two years ago, as the Russian network RT noted. Yet, while Russia is not supposed to mind the forced ouster of a friendly government on its borders or the presence of U.S. and NATO forces supporting the successor regime, a more sympathetic view is taken when Saudi Arabia intervenes in Yemen’s civil war by bombing the country indiscriminately, reportedly killing hundreds of civilians and devastating ancient cities with priceless historical sites that date back thousands of years. This pattern of perverting U.S. intelligence information to bolster some U.S. foreign policy agenda has become a trademark of the Obama administration along with an unprecedented number of prosecutions of U.S. government whistleblowers who release real information that exposes government wrongdoing or waste. This double standard belies President Obama’s assertion that he values openness in a democracy. Investigative reporter Robert Parry broke many of the Iran-Contra stories for The Associated Press and Newsweek in the 1980s. You can buy his last book, America’s Stolen Narrative, either in print here or as an e-book (from Amazon and barnesandnoble.com). You also can order Robert Parry’s trilogy on the Bush Family and its connections to various right-wing operatives for only $34. The trilogy includes America’s Stolen Narrative. For details on this offer, click here. Another well-written, information packed article by the late, great Robert Parry. Thanks for republishing it. Never seen anything like this. You start giving people accurate information and what will they do with it? Hello !!! Elect Donald Trump is all we got for that! Now we have deplorable peoples deciding domestic and international policy – and disrupting the harmonious global community Obama made and Hillary Clinton would have preserved for all Americans. You think Iran, Russia, North Korea or China are more about social justice? Then you are all smoking crack. This is why Obama had slightly hide the facts – if historians want to rummage around for the deeper truths for some historical tome no one will read, okay, but not when there is a fight to be one! True Liberalism is dead. It was fatally by the corporate order during Reagan and has been dying a slow death ever since. A friend of mine just read a long book called “On Lying”, 700 pages long. Among some speech characteristics of people attempting to deceive was the use of long pauses and interjection of “uh”. I remember my annoyance at Obama’s excessive “uh” usage while he was so widely acclaimed as such an orator. I still flash on that photo of Obama’s vitriolic stare in Vladimir Putin’s face at one of the summits toward the end of O’s 2nd term, it was so positively breathtakingly full of hatred that it shocked me. Putin looked embarrassed. Nobel Peace Prize to Obama, bizarre, shows just how upside-down Orwellian that prize really is! It’s a fabulous idea to repost Robert’s articles as ConsortiumNews deems fit. This one is especially important for the tried & true Democrats who see only Republican administrations leading us down the intelligence & integrity rat hole. If a politicians mouth is open and words are emanating, odds are good that what is being said is a lie. Democracy in the US has been destroyed by money control of mass media and elections, the dictatorship of the rich. Control of mass media by the rich hides the real governing mechanisms. War permits primitive tyrant politicians to demand power and accuse their moral superiors of disloyalty. We can stop this tyranny. Our poorly regulated economy allows unethical bullies to prevail in business and deny us democracy. Requiring truth in manufacturing and advertising, plus heavily taxing incomes over twice the average, will remove most incentives for unethical conduct. Until we have these basic controls we will not have truth or democracy. Bravo! Sam F. I can imagine a young scholar of immense capacity evaluating American History accurately for a change so that we all may see how we got to this disastrous place. Yes, we are at right time and place in history to invent the institutions that will secure the future of democracy. I am working to set up a federal college of policy debate constituted to protect all points of view, and to conduct moderated text-only debate among university experts of several disciplines the status and possibilities of each world region, and the policy options. Debate summaries commented by all sides are to be made available for public study and comment. The debates would require a higher standard of argument in foreign and domestic policy on both right and left, and would have much reduced the group-think that led to our endless mad wars since WWII. Extreme and naïve politicians would be easier to expose, and media commentators and citizens would have a starting point and a standard for media investigation and analysis. All comments and criticism of these ideas are very welcome. The policy debate college idea sounds like exactly what we need. Not the only thing we need , of course , but it would help fill a void that seems to be nearly a perfect vacuum these days. My only suggestion would be to pre-load each debate question or topic with a relevant fact base that is 100% stipulated by all parties in the debate. A baseline data reality as an agreed-upon starting point. Too many economic debates , for example , devolve into an argument about what the economic numbers ARE , rather than a debate about what the numbers MEAN. Thank you, Marko, that is a very good idea with related possibilities as well. And on the “deceit” side, we have the exoneration of Hillary Clinton by the FBI before she’s even interviewed, immunity given to her aides and lawyers who were not interviewed separately, but as a group. We have lying to the FISA Court using the “salacious and unverified” Steele dossier (Jim Comey’s words), paid for by the Hillary Clinton campaign and the DNC, which allowed for the spying on American citizens, as well as Donald Trump and his advisers, and the President-elect. There was also the unmasking of American citizens’ names. We have Obama passing an Executive Order near the end of his term allowing access to information between all intelligence agencies. We have Loretta Lynch on the Arizona tarmac talking to Bill Clinton, whose wife she is investigating, something a novice lawyer would never do, allowing her to recuse herself. Corruption and deceit in the upper echelon of the Department of Justice, the FBI, the CIA, most likely James Clapper too. We have Uranium One, the selling off of 20% of U.S. uranium to Russian businessmen. Speaking of Russian collusion, before the Uranium One deal was settled, Bill Clinton got paid $500,000.00 for a one hour speech in Russia. As well, before the deal was finalized, the Clinton Foundation received over $100 million from these Russians. The Clinton Foundation books show over $100 million missing. Hillary was running a pay-for-play scheme over her private servers, raking in money from foreign governments, and all funneled into the Clinton Foundation. Deceit, corruption, and trying to pull off a coup against a duly-elected President. The media has been complicit in keeping this quiet. They need to be broken up and sold off. No competition allows corruption. A tour de force, sir. At least someone was paying attention. Joe Lauria–thanks for this. Please do continue to provide these retrospectives on a regular basis. There is something much more perverse about an articulate presenter of disinformation rather than an individual who is simply wrong. It is within this factor that degree of guilt must be resolved. I imagine each of our leaders, post President Kennedy, in a judicial environment answering prosecutorial questions about illegal activities like Robert Parry addresses here. I saw easily through Bill Clinton’s disingenuousness and voted for Ross Perot, but President Obama completely surprised me. It is true that Obama was a wolf in sheep’s clothing but it is also true that the Republicans control the majority. I think the truest judgement of the Democratic Party is that they always play second fiddle to the Republican Virtuosos who control Washington. Obama was no different. He played to the masses like Trump while delivering the bacon for the MIC. By the time Trump’s administration has come to an end, Obama will seem quite reasonable by comparison. Bolton, Haley, Pompeo and the rest of the gangsters in Trumps cabinet make the word deceit seem like a mild rebuke, because there are no words to describe these people. When assessing a president, we are in reality assessing the control the deep state has over the president. I think Obama like Trump had good intentions when he was on the campaign trail, but once he was in office dark forces took charge of him. Obama may have had good intentions, not Trump. He is a toxic narcissist and no good can come of that. Obama/Trump: two sides of the same coin. Both tools of the MIC. Obama was actually worse in my opinion; the more effective evil, to quote Glen Ford of Black Agenda Report, and a much better liar. He still has people here believing he had good intentions! I like the way you think. Trials, not elections. Hear, hear!! Yes, trials would be very constructive in showing that a strong standard is upheld, as well as the rule of law. Of course the present federal judges would be among the first tried, having skillfully betrayed the people. Indeed , that would be better , but we know it’s not the choice the incumbents will make on their own. There is an alternative that would work out exactly the same way, however , and the incumbents would have no say in the matter : We simply vote them out. The people rise up , taking matters into their own hands , political parties be damned , and absolutely refuse to cast a vote for any incumbent. Unfortunately , just like the incumbents won’t make the choice to bow out gracefully , neither will the electorate make the choice to throw them out on their ears. In the end , we get the government we deserve , and as voting publics go , ours deserves squat. Where would we be without courageous investigative reporters like Robert Parry, and others? Mostly in the dark actually. Most of us don’t have the time and tools to dig out the enlightening information about our government that these truth tellers do for us. I am very grateful to Robert and all those like him for the essential work they do. Everything Mr. Parry states in this article has turned out to be accurate. According to reporter Timothy Alexander, “Obama will be remembered as the president who authorized the destruction of Libya, Syria, Yemen, Somalia, the Ukraine and Honduras (Honduran President Manuel Zelaya was removed from power with help from his former Secretary of State Hillary Clinton).” I would add Venezuela to the list. The white house explains, its Executive Order on March 9th of 2015 by saying: “President Obama today issued a new Executive Order (E.O.) declaring a national emergency with respect to the unusual and extraordinary threat to the national security and foreign policy of the United States posed by the situation in Venezuela…The Executive Order itself declares that the existing Government of Venezuela limits rights and is corrupt, which “constitutes an unusual and extraordinary threat to the national security and foreign policy of the United States, and I hereby declare a national emergency to deal with that threat.” I wonder if Orwell were alive, What would he might think? Orwell would think, “There they go again, just as I have predicted.” Orwell is another truth teller I am grateful to for helping me to wake up to reality, and cut through the persuasive lies we are constantly bombarded with. mike please say hi to joe tedesky. My dad is not well , but on this site joe seemed to be a friend. this has nothing to do with the issue at hand. I do not have more energy left in me to contribute, but I really like joe tedesky . Hi Joe Tedesky! I am sorry to hear that you are not well, and hope that you recover soon. Your many contributions at Consortium News have been really invaluable in providing a humanitarian and practical perspective. We miss your balance and decency, and await your return. Sam F I’m better than ever. Recently my daughter who I haven’t spoke with for 13 years did a 23&me and she found my long loss family. Now my 2 out of the 6 kids we have are back in my life leaving none of our 6 kids behind. Also I was adopted 68 years ago and the 23&me located by other siblings through my DNA. I who grew up an Only Child but now I’m the 3 down in a family combination of 6 as I have now become a Middle Child. I’m seeing family member photos for the first time. My Grandmother drove a car, and made and hustled Moon Shine. It’s all crazy, and besides that I went to Nashville for a week…& visited Studio B yep I saw it where Elvis, the Everly Brothers recorded in the House that Chet Built. I told you I’m doing good. Hi Joe. This is the first I’ve heard of your having health problems. Hurry up and get over whatever ails you, we need your voice here on CN, and I’m sure there are many pulling for you just as I am. Your friend at a distance, mike k.
Good catch on Venezuela and Honduras. We in El Norte tend to forget our neighbors to the South because we’ve so thoroughly dominated them over the centuries. Moreover, it was almost effortless to demonise them: simply refer to their leadership as “friends of Castro.” That was as incriminating as being a “Putin puppet” is today. Why, it was justification for any number of CIA-instigated coups in your countries and even assassinations of your diplomats in Washington DC. But Americans forget that stuff, or never even heard about it. I doubt Obama had much control over the Libya affair or much else either. He wanted to close Guantanamo but that was the first thing the deep state slapped down. Obama was like Trump is today, a talking head with unseen hands up his rsole moving his lips. I do concur with your assessment. Nonetheless, nobody put a gun to Obama’s head to run for office. Moreover, he wasn’t a newcomer as a politician. He knew well in advance what he was getting into. Good post Mr Wilson. That is an astounding capitulation to secret policymaking, although Obama was probably always their puppet. The US agenda in S & C America has always been anti-socialist, defending nothing but anti-socialism in the US. If the US ever has a president who knows foreign policy, he/she will have to replace thousands of mil/intel groupthinkers. Admins are surrounded by those whose policies are concealed by specialized knowledge.